Tick numbers are on the rise in Canada and the U.S. in the Northeast and Great Lakes area, putting more fear for Lyme disease. But, a more serious tick-borne disease may be emerging—one that many have never heard of—that could pose an even bigger threat. It’s called Powassan virus and it’s transmitted by many kinds of ticks, especially deer and groundhog ticks. 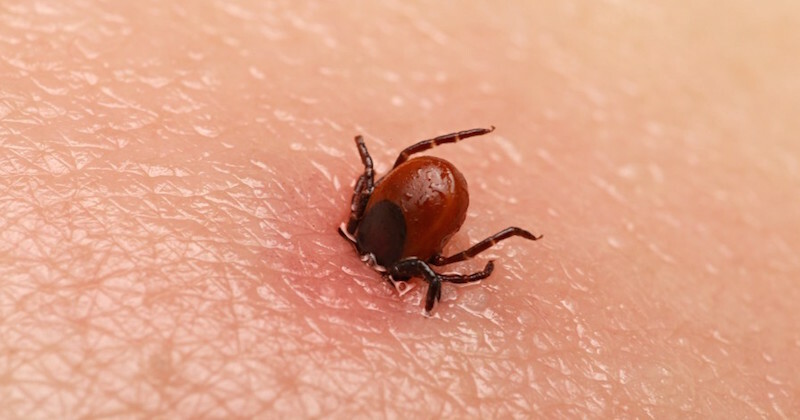 Lyme disease takes 24 hours to cause an infection after a bite by an infected tick, but the Powassan virus can be transmitted from a tick in as little as 15 minutes and can be lethal. Many people who become infected with the Powassan virus do not develop any immediate symptoms. The incubation period may range anything from about one week to a month. With Lyme disease, the incubation period may take up to a few years! 50% of survivors may have permanent neurological symptoms such as recurrent headaches, muscle-wasting and memory problems. About 10% of encephalitis cases are fatal. Once bitten by a tick infected with the Powassan virus, patients are likely to become susceptible to neurological damage due to inflammation of the brain and spinal cord, which can lead to both encephalitis and meningitis. Currently, only about 50 people are infected in the U.S. each year with this virus, compared to about 20,000 people who are affected by Lyme disease. Although contracting the disease may be rare, the possible fatality and because symptoms can be severe, it is helpful to be aware that such a virus exists and can do much harm. Related reading: Increase your body’s resistance against disease-causing viruses. Ticks are becoming one of the fastest emerging infectious disease carriers in North America. This 2014 map shows the high concentration of ticks in northward of United States, moving towards southeast Canada. For people who work outdoors or who love the outdoors, walking or camping in affected areas will increase the chances of becoming infected, whether by the Powassan or Lyme (Borrelia burgdorferi) virus. With warmer days ahead, public health officials in both Canada and northeastern United States say tick population are growing, which could lead to more tick-borne infections of all types. The best way to fight Powassan virus is to avoid getting bitten by ticks in the first place! Avoid walking through wooded and bushy areas with tall grass. Wear light-colored clothes to spot ticks easier. Wear closed-toe shoes and pull sock over pant legs. Wear long-sleeved shirts or use an insect repellent. Bathe or shower as soon as possible after coming from outdoors (within 2 hours) to wash off and find ticks that may be crawling on you. Check your children and pets thoroughly for ticks that may hide under the arms, in and around the ears, inside the belly button and in their hair. Examine clothings and/or put them into a dryer on high heat to kill ticks, if any. Ticks attach themselves to the skin. By removing them soon enough—within 15 minutes in the case of Powassan-infected ticks—you may be able to prevent infection. Do not panic and rub off or crush the tick as this may break off the mouth-parts and leave the sting in the skin. Crushing the tick with your fingers may also get the virus on your fingers. As with insects that bite/sting, the poison or virus is in the sting. You can carefully remove the tick to minimize the impact of the bite. Use a fine-pointed tweezer, and with a steady hand, grasp the tick as close to the skin surface as possible. Slowly pull the tick straight out without twisting or jerking to prevent the mouth-parts to break and remain in the skin. If the mouth-parts are already broken, try to remove them as much as you can without causing further distress to the affected area. Clean the bite area with alcohol or a disinfectant. Undiluted apple cider vinegar can work as a natural disinfectant as well. Put the dead tick in a sandwich bag, write the date you were bitten, and take it to the doctor when you start experiencing any of the symptoms mentioned above. 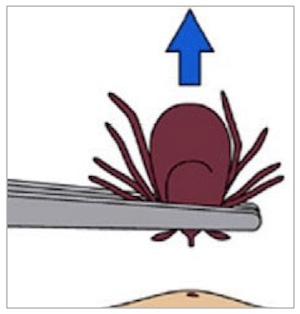 A tick detaches if we irritate it, try to smother it or rub it off. You cannot smother a tick as they need only very little oxygen. It would take days, not minutes. If you make the tick detach by itself, it has to dissolve the “cement” that holds their mouthparts in the skin. They secrete the “cement” into the skin when they first attach. That is why it takes some force to pull a tick out—their mouthparts are glued in the bite wound. So they have to dissolve the “cement” to get away. They do this by regurgitating stomach contents into the bite wound. Since the bacteria or viruses stay down in the tick’s stomach for some hours after the tick attaches, you don’t want the tick to bring up the virus and inject it into you. If you pull the tick off the right way, before the pathogens move up out of the stomach and into you, that won’t happen, and you won’t get sick. If you make the tick detach itself by applying Vaseline, shea butter or coconut oil (as many sites suggest), you have a good chance of getting very sick for the rest of your life. The best approach is to do a thorough tick check frequently, and pull that tick off using a safe method. Don’t fool around, don’t wait, and don’t ever make the tick detach itself.